Becoming a local celebrity is not inexpensive. Besides the cost of the training and coaching, you have to pay for all the airline flights, hotels, rental cars, meals, and any other miscellaneous expenses to get to the cities to be on television. 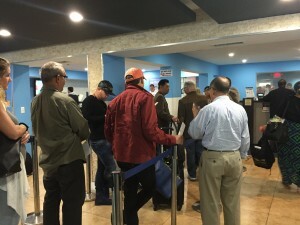 So when I looked on line to rent a car for my two days in Miami; even Thrifty Rental Car was going to cost almost $150, I looked for alternatives. Where? On Expedia and Travelocity, of course. When I found Fox Rental Car could cost me about $100 for the two days, I decided to book with them, but not on Travelocity or Expedia. I went direct to the Fox Car Rental website and guess what? It cost even less! The next challenge was finding a flight from Miami to Ft. Myers or Tampa/St. Petersburg. Because of the lateness of the date, the cost was close to $300, so I thought about driving. But typically drop-off charges are $75 to $175. Before making the final decision to fly or drive, I went back to the Fox site. And guess what? The cost was actually less—$65.86—including the drop-off charge! I would never have believed it, if I hadn’t seen it for myself. So for three days and several hundred miles of driving from Miami to Ft. Myers, then onto Tampa, I paid under $70. What a learning! So far, so good. Arriving at the Miami Airport, I suspected that Fox was not in the Rental Car Center, but off-site. I was right. I found the shuttle to the Fox office. While the bus was a little more run-down than those of the major brands, but to save almost $300, I could live with “run-down”. Arriving at the equally shabby Fox office, waiting for me was the real cost of this inexpensive booking. I tried to push the door open, but it would not move. Why? Because the line to get to the counter was back to the door. It took over an hour a half to get to the counter to be served; then it took another half hour to finish the booking process and get a car. The manager was so disturbed by the unresponsive system, he wrote out my contract by hand and sent me on my way. The problem was a new IT system that was super slow and kept crashing. I can only imagine the frustration of the employees who were dealing with the even-more-frustrated customers who were waiting in line. Had I had an important appointment, I would have been very upset; but given the fact that my schedule was flexible, I took the experience as the cost of saving hundreds of dollars. The car Fox gave me was an almost new Kia Rio, great on gasoline and very comfortable. The only thing that was missing was cruise control, which would have made a substantial difference in the hundreds of miles I had to drive across Florida. When I went to Kayak.com to look for flights from Tampa to Jacksonville, the flights were surprisingly expensive. The least expensive was Silver Airlines through United. However, instead of booking through United, I went directly to the Silver website (https://www.silverairways.com). There, I not only saved $20, but I was also able to get a seat assignment. Booking through United, I would have had to wait for a seat assignment, until the day of the flight. Plus, with a phone call, I was able to add my United number to the ticket, so I got United mileage credit anyway. Once you are accustomed to using the TSA Pre✓® process of The Transportation Security Administration (TSA), going back to the “regular” line is a serious complication. Some of the smaller airlines, including Silver, do not participate in the TSA Pre✓® program; I had not accounted for that additional time, and I almost missed my flight. When the Travel Costs Are On Your Own Nickel. . . Sometimes, it will make sense to exchange money for time. Other times, it won’t. The great thing is that you have options, and you can decide for yourself.